The Veritas Scraping Plane is the ideal tool for final smoothing. Tear-out is virtually eliminated with the cutting action of the included scraping blade. The generous Bubinga front knob and rear handle make it comfortable to use for extended periods and the large sole ensures an accurately flattened surface. The adjustable frog enables blade angles from 0° to 25°, providing fine control of the cutting action. A feature unique to the scraping plane is an integral thumbscrew that bows the blade to eliminate ridges in the work surface caused by blade corners. The plane comes with a 1.4mm(0.055") high-carbon steel blade suited to this technique, and an optional 3.2mm(1/8") thick blade of A2 tool steel is available for those who prefer uncambered blades. Weight is 1.8kg(4lb). 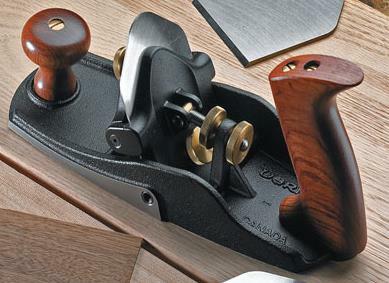 There are three steel types available for veritas planes. For most of the planes we offer for sale we have opted for the new PM-VII type because we believe it suits the needs of most of our customers. The following describes the virtues of each type of steel. 01 steel is easy to hone and a very fine edge achieved relatively quickly. A2 steel takes a little longer to sharpen but retains its edge for longer. PM-V11 alloy steel is easier to sharpen than A2 and hold an extremely durable cutting edge for up to twice as long. Veritas range offer some of the most accurately made planes available today. This combined with some interesting and unique aspects to the design make them an ideal choice for the serious craftsman in wood. Plane bodies are made from stress relieved ductile cast iron surface ground to very fine tolerances. Where possible we supply planes fitted with the new PM-VII blades as standard for extended edge holding on all types of wood. Most planes have adjustable mouths and blade adjustment is via a single screw/lever ‘Norris’ style mechanism that adjusts the blade up/down and laterally. Grub screws from the side ensure correct blade alignment.